Very few retailers share actual performance metrics with customers. They may provide sweeping statements like, “Our service is second to none,” but they won’t go into specifics. This is because they don’t have the data, don’t trust the data, or are concerned about sharing potentially sensitive data. That last item, however, is a key to building customer trust. One retailer has bucked the trend and put its service commitment out there – the U.S. supermarket group Kroger. Kroger implemented Irisys’ Intelligent Checkout Management – Kroger branded it as “QueVision” – to speed up its checkouts. The system uses Irisys infrared cameras to identify queuing customers in the Kroger checkout. The system then feeds this information to an Irisys software module that analyzes checkout demand and supply data – and predicts how many checkout lanes should be open in 15 and 30 minutes. The Irisys solution and operational processes behind it have led to a reduction in Kroger’s customer wait times times from 4 minutes to 26 seconds. Kroger’s fast Kroger checkout has been featured in USA Today, The Wall Street Journal, NBC’s Today show and in other major media across the country – that’s positive exposure for a supermarket. 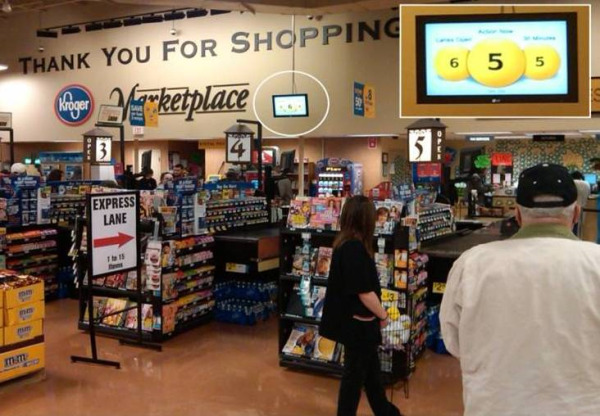 Instead of sharing the prediction only with staff, Kroger took the bold step of displaying the information on large screens in the checkout area. The screens show how many checkouts are currently open; action now – the number of checkouts that need to be open to ensure wait times meet an established KPI; and an indicator of the requirement in 30 minutes to assist with planning breaks. Staff can see the situation and quickly react to changes. Customers can also see this information – meaning the shopper knows Kroger and its associates keep service at the heart of the operation. The Irisys Queue Management Solution can measure both mainbank and self-service queues. It gives associates the information to manage in real-time and management an enterprise view of store-level, regional, and overall performance. Contact us to learn more about the Irisys Queue Management Solution that delivers shorter queues and faster checkout for grocery stores and supermarkets.